An ornamental plaque on which is represented as an object in relief, such as a figure, head, flower, etc. 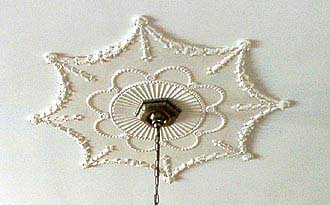 Ceiling medallions: Cloth-reinforced plaster medallions are commonly used in the 19th and early 20th centuries. Oriental rugs: Large design found in the center in some oriental rugs; the focal point of the design; typical shapes are diamonds, octagons and hexagons. Stained glass: In Gothic and Gothic Revival stained glass windows, medallions in nave windows depicted scenes from the Old and New Testaments. A circular, oval, or square decoration inlaid, carved, or painted on a surface. More or less centralized and isolated. Heads carved in low profile were often used on sixteenth-century Renaissance and seventeenth-century Baroque furniture. A circular object that has been sculpted, molded, cast, struck, stamped or some way rendered with an insignia, portrait or other artistic rendering. For example, the attribute of St. Jude the Apostle is a medallion of Jesus.